Central African Republic Bans Texting, Citing Need For Order : The Two-Way The poor country has been plagued by political turmoil and Muslim-Christian fighting. The government cut off texting amid a new round of violent protests and calls for a general strike. A Muslim shopkeeper uses a mobile phone in front of his shop in the PK5 district of Bangui, the capital of the Central African Republic, on April 30. The nation, which struggles with conflict between Christian and Muslim militias, banned texting on Monday. 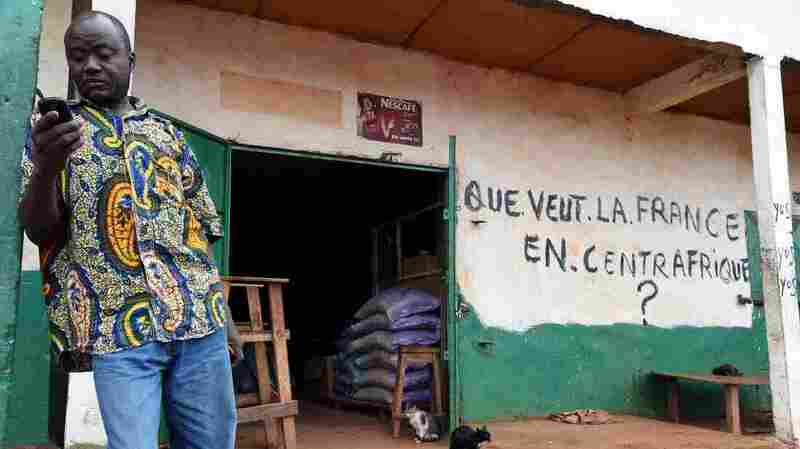 The Central African Republic is an impoverished, troubled country. Yet many people have cell phones that are used to spread information, rumors — and to organize protests. Authorities have now instructed cell phone providers to suspend all text message services, a ban prompted after a group attempted to organize a civil disobedience campaign through SMS messages. Text messaging has not worked since Monday, Reuters reports. Communications Minister Abdallah Assan Kadre said the suspension of SMS services was ordered by the nation's prime minister, André Nzapayéké, " in order to contribute to the restoration of security in the country." "Last year, Muslim militias helped overthrow the country's Christian president of the Central African Republic and marauded through Christian areas. Today, the circumstances are reversed, with Christian militias terrorizing Muslim communities and prompting a mass exodus. French and African peacekeepers have mostly failed to stop the violence as the isolated country of 4 million continues to unravel." Warner also noted how cell phones — and texting — have affected those threatened by violence. He described a Muslim man whose cell phone is filled with photos of the mutilated bodies members of his community. "Even in one of the poorest countries in Africa, the ubiquity of camera phones means the wounds live on after bodies are buried," Warner reported. "They're texted and shared and become part of the terror driving tens of thousands of Muslims over the border to become refugees in Chad or Cameroon." The current texting ban was prompted by text messages sent by an organization called Collectif Centrafique Debout, which appeared to be organizing a general strike. Reuters reports that the SMS messages "urged people to stay at home until there is complete disarmament, especially of the PK5 Muslim area." That area is the last major enclave of Muslims in the city, Reuters reported several days ago, and calls for PK5's disarmament began after an attack by Muslim gunmen on a church last Wednesday. Attempts to send text messages result in a French message saying "SMS not allowed," AFP reports. A government source told AFP that the suspension would last several days.